The motion control of the past in the world of DJing has been mostly limited to handheld controllers with gyroscopes built in – the likes of Wiimotes, Midi Fighter 3Ds and Numark Orbits. But what happens when the gear dissappears or becomes wearable? Today we take a look at some of the most interesting developments in DJ-applicable motion control devices – read on. Motion often feels extremely contrived when used to control DJ software – perhaps because it’s associated with the exaggerated waving about that so many DJ megastars do when they’re not actually touching the controls. The issue becomes creating motion-based controls that not only are fun to use, but go beyond the basic gimmick of motion control to become useful, precise, and convenient for a DJ or live performer. 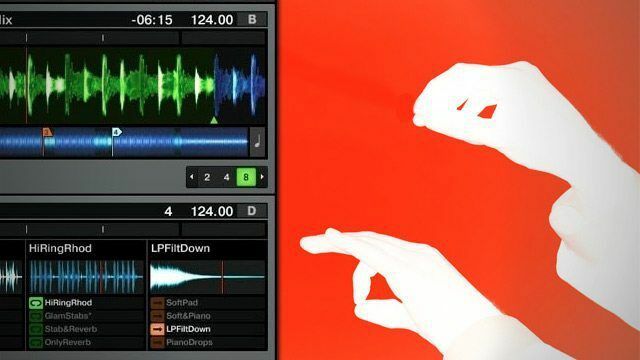 You might recognize Gztomash’s name from previous articles on DJ TechTools where he’s crafted up ingenious solutions (like making a sequencer out of Traktor’s Remix Decks) – and earlier this year he decided to craft his own motion-based DJ solution that uses a glove system. The motion control is very similar to Imogene Heap’s gloves and allows for a variety of controls, demonstrated in the video below. Advantages: Variety of control gestures. Glove makes you look like a cyborg. Drawbacks: Custom solution means you’ll have to DIY if you want one! We wrote about the Leap Motion device over a year ago when it was still in development, but now the tiny motion sensor device is on the public market for an reasonable price tag, and all over YouTube we’ve started to see the unit in use with a number of different audio applications. Advantages: Very precise, can detect individual fingers. Already a fairly wide base of users. Cheap! Drawbacks: Limited to a certain “detection zone” above the device where all motion is sensed relative to. This is still upcoming tech – there’s no videos of it in use with digital DJ software, but we’re pretty sure it could be spot on. Using a flexible armband to detect the muscle tension in your arm, MYO promises to be able to interpret a variety of gestures and arm movements with ease, and with a one-size-fits-all band it won’t have the same physical limitations that glove-based controllers might. We would be remiss in not mentioning the product that Mad Zach showed off in action a few months ago on the DJTT blog, the Source Audio Hot Hand. Probably one of the smallest pieces of wearable motion tech out there, the Hot Hand detects motion along three axises. Here’s Mad Zach rocking it in his own review – including him wearing it on his foot. Advantages: Wireless + wearable, very easy to set up. Drawbacks: MIDI mapping all axises rapidly becomes very complicated. Need to attach it to a small body part like fingers or toes. We’re pretty sure there’s even more exciting motion-based technology on the horizon – but for now it seems unlikely that performers will adopt currently available motion technology until even more simple and reliable solutions come to market that really focus on performers. Would you ever use motion technology in your DJ sets or live productions? Let us know in the comments below.